Why not add a little bit of sparkle and glamour into your wedding flowers? Lots of brides are adding diamante accessories into their bridal bouquets. This is a really effective if you also have diamante or crystal bead detailing on your dress. 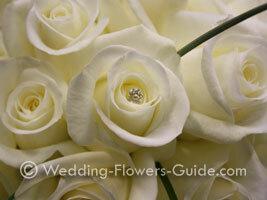 Here are some tips for effective ways to add those all important sparkles into your bouquet. These are groups of diamantes that are placed randomly in-between the flowers and foliage of the bouquet. Here you can see them in a mixed handtied bouquet, they work particularly well if you've also got foliages running throughout the bouquet. 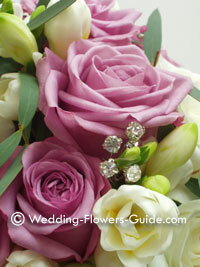 The diamante headed pins can be placed into the centre of roses as seen here or other flowers such as gerberas. You can choose to place them in every flower head or just in a few. Diamante beads work well when placed on the ends of grasses and look particular nice when you walk down the aisle as the light catches the beads as you walk. If you're having a posy style bouquet don't forget to ask your florist to add diamante pin detailing on the ribbon handle. This is a beautiful finishing touch. You can also add diamante brooches and clasps if you are looking for a popular vintage wedding style. Here are more ideas for wedding accessories to enhance your bridal bouquet and venue flowers.